I've been writing about catarratto this week, both the Wine Word of choice and an incredibly interesting orange wine called Il Censo 'Praruar' that's 100% catarrtato, so it seemed right to finish up with another of that native Sicilian variety. This one was a Vine Club pick last April with a great response and, considering it was 82 degrees here in New Orleans yesterday - Merry Christmas! - a crisp white seems fitting. The estate makes several blends using indigenous and international varieties to make red, pink, white, sparkling and naturally sweet wines. The range and number of international grapes is a long enough list to make me curious. They are clearly not wholly dedicated to native varieties and ancient processes, but they are committed to eco practices, implementing solar panels and night harvesting to conserve energy, and boasts a Kyoto Club membership. The winemaking is modern and technically minded, with a team of testers and checkers, but they also contribute to music and the arts, having produced a CD that raised over 120,000 euros for the children's heart surgery ward at the Palermo hospital, and established a literary prize, an archeological scholarship and sponsored the restoration of a Madonna and Child painting at the regional museum in Trapani. Whew! Lots of philanthropy, lots of romance, lots of wine. 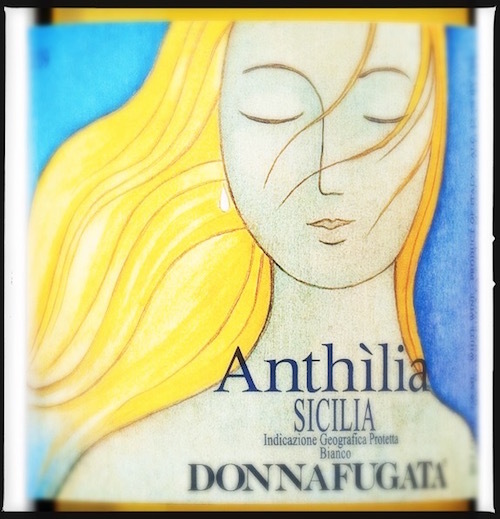 Donnafugata Anthìlia 2013 appeals to the masses with easy drinkability, and yet it has a character all its own, hitting a high note of elegant fruit and deliciousness. To add a little more romance to the tale, the primary grape is the Sicilian native catarratto, grown in flinty volcanic soils. Mineral notes on the nose marry with a hint of anise, apricot, pear and lemon with a medium-light body, easy acidity and mellow, smooth finish with great balance. Smoked fish, anchovies, olives, shellfish and well-chilled Anthìlia.